The name literally means “the heroic” which sounds good for bikers hungry for new adventures! L'Eroica can be used by motorcycle and passes through some of the most authentic landscapes of Tuscany in the countryside between Chianti and Siena, allowing you to take in some breathtaking views. The perfect times of the year to ride along the Eroica are spring, early autumn and early summer, when the weather isn’t too hot and the sun is bright. The routes are marked with permanent signs, so you won’t need GPS : it’s really easy to find directions. According to expert riders, the route is suitable for enduros but also light naked motorbikes. The road is not difficult if approached with enduros, while it is with road motorbikes: the soil is harsh and bumpy. It is advisable to carry a kit in case of puncture. The permanent route winds through stunning Tuscan countryside near Siena and touches five different areas: the areas of Chianti with Gaiole in Chianti, Brolio and Castelnuovo Berardenga, the area of Siena Valdarbia with Radi, the area of Montalcino (the halfway point), the area of Val d’Orcia with Lucignano d’Asso and the area of Crete Senesi with Pieve a Salti and Asciano. Gaiole is a small medieval town located in the area known as the Chianti castles area and characterized for both intact and ruined castles and parish churches. Vineyards dominate the landscape as far as the eye can see. This castle has Longobard origins and has a neo-gothic style. It still belongs to the family of Baron Ricasoli. You can visit parts of the castle, the gardens and ramparts. This town is situated 20 kilometres from Siena and was built as a "New Castle" by Siena in 1366, as an important outpost border. The name Berardenga comes from Count Berardo. Here you can see the Vicolo dell’Arco, the Church of San Giusto e Clemente and Villa Chigi Saracini. This is a land for wine lovers and slow travellers. 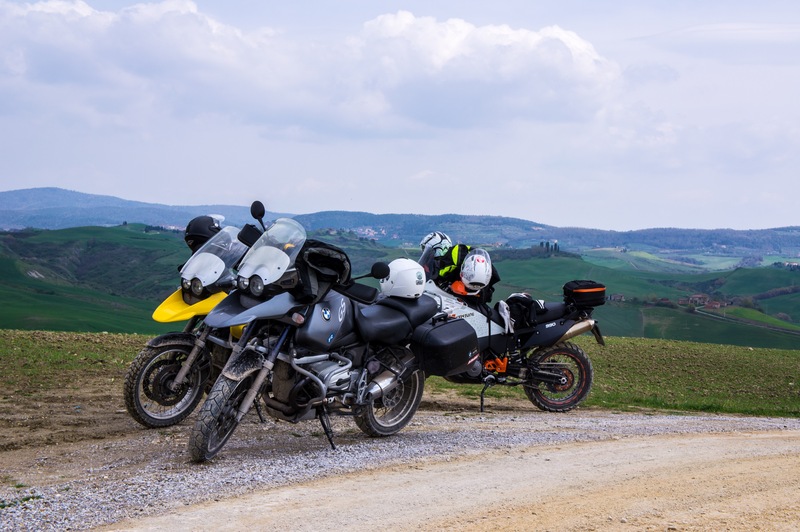 The area, in fact, boasts both some of the most famous grape varieties in the world and dirt roads that are loved by bikers and motorbikers. The hill town of Montalcino, completely encircled by fortified walls, is situated in the Val d’Orcia and is renowned for its world-famous Brunello di Montalcino. Immersed in Tuscany’s history and countryside, it is the quintessential Tuscany seen in postcards. Read more here. First of all, do not confuse this Lucignano with the one near Arezzo. The town consists of two streets and two churches, a few houses, an old shop, the noble home with a garden and the old fountain. The literal meaning of “Crete Senesi” is Sienese clays. They are, in fact, very distinctive of this area and resemble a lunar landscape. This is a clay territory, crossed by winding streets, characterized by the presence of “biancane” bumps round in shape and white, giving the feeling of traveling on a sea of land and gullies, similar to deep cuts, lacerations that open this land very crumbly. The town is Etruscan in origin, as shown by the finding of a necropolis dating to the 5th century BC. If you arrive here on the second Sunday of the month you’ll find the “Market of the Natural Clays” with food specialities of the area, local artisan production and antique objects.